It can be argued that the Auto Industry is fueling America’s economic recovery, not benefitting from it. Toyota CEO Jim Lentz thinks so and made his case at a recent auto show. In a great contrast to the shut down of the government, a quick review of the auto industry's contribution to the economy is refreshingly positive. There is little doubt that America has either decided to ignore the challenges of the current economic situation, or that despite those challenges it is again growing. Auto sales have jumped in the past 18 months. At an auto show in Michigan Friday the 27th, Toyota North America CEO Jim Lentz made some factual statements that seem to support his premise that the auto industry is not just benefitting from the current economic recovery, but driving it. Speaking just before our government shut down, Lentz’ comments offer a good reminder of what the real economic engine in America is. Consider that about 15.5 million cars will be bought this year. That is an all-time high. Lentz says that many projections are for up to 18 million to be bought annually in the coming few years. At its current pace the industry in America generates $70 billion in tax revenue. Half a trillion in payroll dollars flow into American households from the auto industry and fully 8 million workers depend on the auto industry. According to Lentz and others, no other single industry employs as many Americans. This has been true during most of the past 50 years, but it is always a surprise to many who assume otherwise. An expansion of this industry means expanded tax revenue to support the ever-expanding social network our government (and we) are creating. Many assume that the vehicles made in the US stay in the US, and thus it is a zero-sum game. Not true. Toyota alone has expanded its manufacturing of vehicles in America for export to other places dramatically over the past few years. A significant number of the vehicles Toyota and its American employees build in the US are exported for profit. Each one built and sold generates an enormous economic gain for America. At this time Toyota exports American made vehicles to 23 countries. Toyota is planning to expand that to other countries in the next year, mainly in Latin America and the Caribbean. 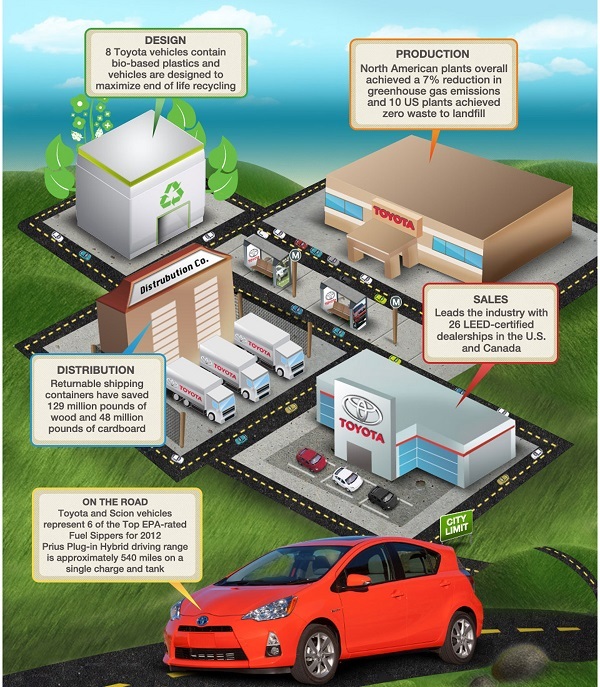 Lentz highlighted Toyota’s North American contribution to the economy. At this time, 37,000 Americans are employed directly by Toyota. Most estimates agree that there is a 10X factor of support jobs to serve those positions. Thus, about 370,000 American jobs are related to Toyota’s American manufacturing operations. Summing this up Lentz says “From jobs to sales to exporting vehicles to other countries, the data clearly shows the auto industry is driving America’s economic recovery. And will continue to do so.” Lentz says that the way Toyota will continue to be strong is by continuing to do more than its competitors. Saying that high quality, durable, high fuel economy cars are no longer special, Lentz explained that only a dedication to customer wants and needs will separate the winners from the laggards going forward. The great news for consumers is that now, pretty much all cars are of excellent quality. As our government is presently shut down, and many argue about the economic impact of the shut-down, it is good to keep in perspective who and what really drives our economy.